Precise scales are the foundation for producing the right colors. 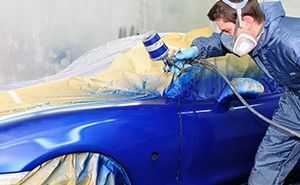 Dedicated refinish solutions combine high-performance weighing with a truly industrial design, delivering stable and accurate weighing results under the demanding conditions in an automotive body shop. Global approvals allow use in hazardous areas and for legal-for-trade applications. Standardized communication protocols and interfaces make integration into paint mixing software easy. We offer a refinish scale for every need and budget.